Analysis of Main Causes that Oil Return of Diffusion Pump- Vacuum Pump - EVP Vacuum Solution! Oil return is the biggest weakness of the oil diffusion pump, The return oil just only can be reduced and can’t be eradicated. In order to reduce the diffusion pump oil return, Finding out the main source and reason of oil return is necessary. Then thinking how to reduce the oil return rate. 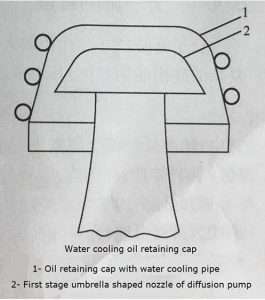 (1) Condensation on the surface of the top nozzle oil film evaporation, or oil film re-evaporation after crawling to the nozzle outside surface, these part have 70% of the total amount of oil return. (2) The evaporation of oil film condensed on the pump wall is related to the cooling of the pump wall. (3) The scattering of the vapor jet after colliding with the pump wall is related to the intensity of the jet. (4) The diffusion of the oil molecules to the high vacuum side in the vapor jet is related to the jet temperature. (5) Oil film or oil droplets flowing back to the oil sump from the pump wall are heated and evaporated again in this area before entering the oil sump. (6) Pump oil thermal cracking or catalytic decomposition due to contact with the metal, resulting in light more volatile components. (7) Pump oil has paroxysmal boiling in the use process, resulting in a sudden burst of nozzle steam flow, the irregular heat movement be exacerbated, resulting in oil vapor return. (1) Diffusion pump oil with lower vapor pressure at room temperature, better heat resistance and anti-oxidation performance. (3) Install a water-cooled baffle between the diffusion pump port and the system being pumped. To further improve the oil retaining effect, using liquid nitrogen cooled cold trap. It is worth noting that the installation of a water-cooled baffle or cold trap will reduce the conductance of the suction pipe between the pump port and the vessel, then reduce the effective pumping speed of the diffusion pump. 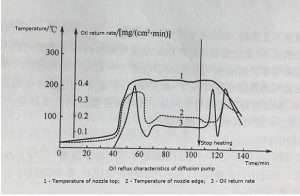 (4) At the heating initial stage and soon after stopping heating of diffusion pump, it appears several times oil return rate more than the normal use. Therefore, it is advisable to disconnect the pump from the pumped vessel through the vacuum valve during this time. (5) Diffusion pump heating power should be maintain around the best value, overheating and underheating will increase the oil return rate. In the overheated state, it will also produce a large number of light distillate then vessel be contaminated. (6) vessel that be pumped and high vacuum catheter should to be often bake cleaning. (7) In the vacuum system with strict requirements on oil return, the oil retaining trap should be installed on the bypass pipe between the high-vacuum part of the system and the front-stage mechanical pump to prevent the backflow of the oil vapor of the mechanical pump to the high-vacuum side. When the mechanical pump stops working, it should be sure to turn off the vacuum valve between the diffusion pump and the mechanical pump to isolate the diffusion pump from the low vacuum pipe. (8) When the diffusion pump is not working, the mechanical pump should not be allowed to pump the empty vacuum system for a long time. Because there is no diffusion pump to suppress the mechanical pump oil vapor, the mechanical pump oil vapor that low vapor pressure can easily pollute the high vacuum section. (9) Once the vacuum system is contaminated with oil vapor, a certain amount of dry nitrogen can be flushed into the system to flush the vessel. As long as the pressure of nitrogen is high enough (0.1-0.2 Torr), CO2, H2O, oil vapor molecules or other contaminants adsorbed on the surface will be displaced and pumped away by continuous adsorption and displacement of nitrogen molecules. After a period of continuous flush, the vacuum system can be restored to the clean state.